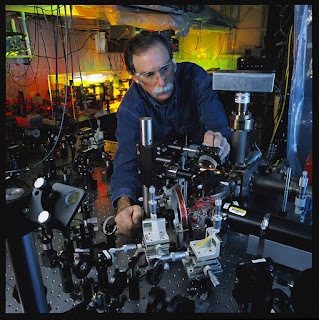 I mentioned in the podcast that Wineland's main focus is developing more precise atomic clocks. Other than just keeping time, these clocks form the basis of how the Global Positioning System works. Much of his research relies on the ion traps he developed. But how exactly do they work? Here, Wineland describes how he and his team use an electric field to create these traps. These atomic traps are versatile because the atomic time keepers in atomic clocks and the quantum "qubits" which form the basis of a quantum computer, both need to be completely isolated from the environment. The whole series of nine videos can be found here, plus a lecture he delivered as part of their "Quantum Frontiers Distinguished Lecture" series.